400~ B	C, it is said that in ancient Greece, a boxer named Damarchus was transformed into a wolf for nine years before once again re-donning human form. There is little to be found regarding this part of werewolf history, yet what we do know about Damarchus can be found in Pausanias’ Description of Greece, a cultural examination of Greece chronicled throughout ten books. Although his description of Damarchus is little more than two sentences long, a great deal of weight is placed on Pausanias’ account, as it helps us trace the presence of werewolves throughout history. That being said, taking a closer look at Grecian traditions and rituals, along with a quick overview of Greek gods, can help shed light on the story of Damarchus. 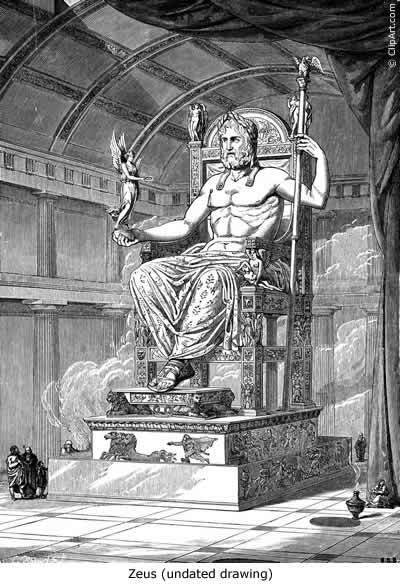 It’s well known that the Grecians worshipped several deities, each one known for their unique specialty or power. Zeus is probably the most well known of the gods, acting as King of the gods at Mount Olympus and known for his lighting bolt and womanizing antics. Throughout history, however, Zeus’ role has changed and evolved, and several localized cults in Greece developed personalized versions of Zeus, one of which is that of Lykaios Zeus (aka Lycaeus or Lycaeun Zeus) of Arcadia. The Arcadians believed that the first king of Arcadia, King Lycaon, sacrificed his own son at a feast, which he then served to Zeus, his guest. In disgust, Zeus turned the king and his sons into wolves as punishment. This gave rise to an annual sacrifice in which the clansmen of Arcadia would gather on the slopes of Mount Lykaion – or Wolf Mountain – for a similar ritual sacrifice to Lykaios Zeus. The flesh of a sacrificed young male would be mingled with the entrails of a wolf and presented to Lykaios Zeus; any young man who ate of the flesh would then be turned into a wolf for nine years. If the werewolf restrained from eating human flesh during the nine years, he would be restored to his human form in the tenth year. If not, he would be cursed to remain a wolf forever. With this in mind, the account of Damarchus as written by Pausanias is quite an allegation. He, in fact, claims to not believe that Damarchus been turned into a wolf at all and uses the Arcadians’ own remembrance of Damarchus as evidence. Yet Pausanias’ account gives us werewolf lovers all the evidence we need. The fact that Pausanias had to include in his chronicles the Grecians tenacious belief that a once famous boxer spent his youth as a roaming werewolf, means that the legend struck a chord with people then as much as it does now. And although recent archeologists have discovered sacrificial trenches on Mt. Lykaion that date back to a thousand years before Zeus was even worshipped in Arcadia, the tale still stands: eat the bloodied flesh of adolescent human males mingled with that of the wolf, and you just might spend the next nine years howling at full moons and avoiding silver bullets – or forever, if you’re naughty.